Looked at as a conventional NAS, Synology's compact EDS14 has a number of limitations but, as a rugged storage appliance and, more importantly, a self-contained video surveillance platform it has a lot going for it. Small enough to fit comfortably in the palm of your hand, the diminutive Synology EDS14 is unlike any other NAS appliance you're likely to come across. Not least because it doesn't have room inside for any disks, just a couple of USB ports for external disk attachment and a slot to take high-speed flash memory cards. It's also fanless and very rugged, allowing it to go where other NAS servers can't. Moreover, add one or more IP cameras and Synology's Surveillance Station software, and it makes a robust and very usable video surveillance platform. Don't be fooled by the lack of inches as inside the EDS14 there's room for a 1.2GHz Marvell Armada 370 processor plus 512MB of RAM. There's also space for a pair of Gigabit network ports as well as those two USB ports, one of which is USB 3.0. Okay, it's not a mind blowing spec, but it's good enough to run Synology's tried and trusted DSM operating system and enable us to use it to share out files and printers over our LAN - just like a full-size NAS appliance. You can't expect much in the way of performance but although only single-core, the Marvell Armada processor isn't the main limiting factor. Indeed the throughput you get will be mainly down to the USB ports and the disks or SD card used. For our tests we plugged in a 500GB Samsung USB 3.0 M300 Portable disk and connected up a Windows client over a Gigabit network connection. Using this we managed to read data via the EDS14 at up to 52MB/sec with writes a little slower, averaging out at around 40-45MB/sec. Reading and writing to an SDXC card was slower still, on average, about half as fast as our USB disk. These figures are nothing like what you might expect to get from a conventional NAS box but then USB disks aren't exactly the fastest kids on the block, and top-notch performance isn't the goal here. The aim is to be able to put a NAS server in places that would otherwise be out of bounds due to lack of space, remoteness, extremes of temperature and so on. To this end the EDS14 is fanless and silent and, although it runs quite hot, able to work in temperatures from -20 to +50 degrees Celsius. It can also work off an input voltage of 7-24V enabling it to be powered from a variety of sources including a car cigarette lighter and, importantly, 12V supplies like those run to surveillance cameras. 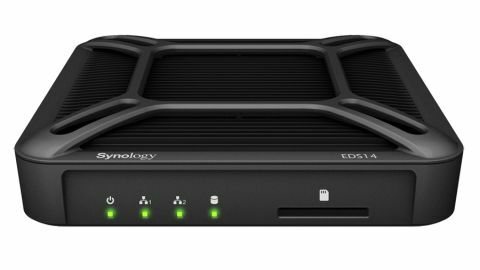 On the downside, at around £160 inc. VAT (around US$275, AUD$295) the EDS14 looks a little bit expensive compared to most entry-level NAS appliances, including others in the Synology DiskStation family. However, it's not really competing with those products but is designed to fill a specific niche in the market, and it's not until you add Synology's Surveillance Station into the equation that you start to appreciate just what this little box is all about. Put simply, installing Surveillance Station transforms the EDS14 from a simple NAS box into a self-contained network video recorder (NVR) and monitoring centre. Moreover, Surveillance Station is available for free, just like most other packages for this, and other, Synology NAS boxes, from the Synology package centre. That said, there is a cost implication. A license for one camera is included free of charge but if you want more (the EDS14 can handle up to five) additional licenses are needed. A pack of four will cost around £170 inc. VAT (around US$290, AUD$310), effectively doubling the cost of this box. However, that's the only extra required and it should work with most IP cameras on the market. It certainly had no trouble at all discovering and automatically configuring either our elderly Linksys (Cisco) camera or a brand new D-Link dome camera on our test network. The Surveillance Station software also proved fairly easy to get to grips with, enabling us to view live video feeds through the web-based interface, setup recording schedules and configure the EDS14 to capture video in response to motion detection and other external triggers. Alerts can be sent out by email, SMS or Skype in response to these events, and also whenever a new camera is added or communication with a camera lost. Remote access to the EDS14 and Surveillance Station via the cloud is another useful option together with a mobile app to view both live video feeds and recording from a smartphone or tablet (Android or iOS). There's even a power outlet on the side of the EDS14 (hidden away behind a tiny rubber bung) to enable Surveillance Station users to control door locks and gates, and turn other devices on and off remotely.